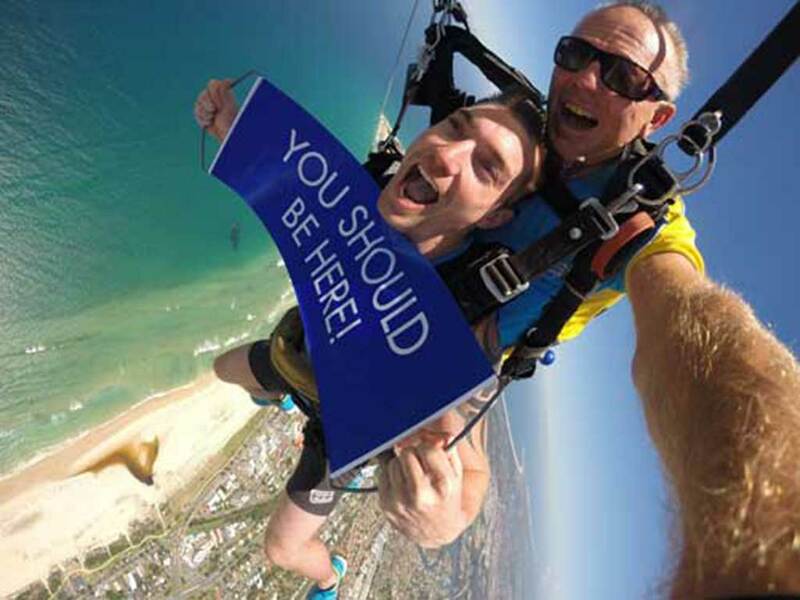 The Gold Coast's number 1 Beach Skydive! Skydiving is known, for very good reason, as life's ultimate thrill. It's the big daddy, the adventure and rush by which all others are measured. Amazingly, the buzz of free fall is an easy and safe experience, especially during a tandem skydiving adventure. Nothing more to pay on the day! Your Australian Parachute Federation Levy is included in the price. On the ground you'll be suited up in skydiving gear and your professional skydiving instructors will run through a few "dirt dives" – practice skydiving exits. You'll also be taught the skydiving basics of canopy control and safe landing procedures. Once you're confident with this skydiving knowledge you'll enjoy a 20-minute flight to an altitude of approximately 12,000 feet where, after a final check, it's time to hop out and take the quick way down – straight onto the beach! The beauty of tandem skydiving is that it requires none of the usual intensive skydiving training, but offers 100 per cent of the mind-blowing, 200km/hr open-air thrill. The feeling is often described as floating on a cushion of air as you hurtle 7,500 feet through the sky in 45 seconds. The skydiving parachute is deployed at around 4,500 feet, offering an intensely serene experience and one of the world's greatest views – perfect for reflecting on the high-adrenalin skydiving adventure you've just enjoyed. During the five-minute glide to earth you'll be taught to control your direction and descent speed and, once you touch down, you'll be on a high for weeks – guaranteed. We offer a FREE pickup from Surfers Paradise every day at around 7am and free return transport. Please contact the office to confirm. If you are located in an area between Tugun and Surfers Paradise or you're coming from a different direction, but are close to our office, please call (07) 5599 1920 to discuss transport options with our staff. If you would like to make a booking less than 24 hours in advance you must call the office to confirm availability on 5599 1920, someone is available to help you after business hours if necessary.